Recognizing the birth of a child as one of the most significant events in the life of a woman and her family, Parkwest Medical Center has designed its Childbirth Center to ensure a memorable and comfortable experience. Located on the second floor of the six-story Riverstone Tower, the Childbirth Center is comprised of 20 suites, and two operating suites. Valet and shuttle service are available to transport patient and visitors from the parking lot to the hospital entrance. The center’s advanced communication systems, decentralized supply, and work stations are designed to position our highly qualified staff in close proximity to patients. Systems have been built in to ensure close observation of all mothers and newborns in our care. At Parkwest Medical Center, we want to help create special memories through our family-centered approach to the birth of your child. Our caring team of physicians and childbirth professionals will listen to your concerns and wishes and tailor the labor and delivery experience to meet the needs your family. If you are planning to breastfeed, Parkwest offers classes during the prenatal period to help prepare families for breastfeeding. The Childbirth Center also employs board certified lactation consultants who make rounds to see breastfeeding patients while they are in the hospital. While the Childbirth Center nursing staff are also trained to assist with breastfeeding, lactation consultants can assist with latch-on difficulties and other feeding problems during the patient’s stay in the hospital. Mothers experiencing feeding difficulties at the time of discharge may receive a feeding plan to explain alternative feeding methods and the use of an electric breast pump to help the mother establish and maintain her supply until the baby is nursing well. Please call the Childbirth Center at (865) 373-4299 with questions or click here to view the online breastfeeding guide. When scheduled for a cesarean section or induction, there is a possibility that your procedure will have to be rescheduled or postponed due to an unanticipated increase in laboring patients. If this is necessary, a member of the Childbirth Center staff will call you the night before, or the morning of the procedure. We know that special arrangements have been made with your family members, etc., and we truly regret any inconvenience. All efforts will be made to accommodate you, and we look forward to giving you the best possible birthing experience. If you have any questions or concerns, please talk with your physician or contact the Childbirth Center at (865)373-4299. To help you learn as much as possible about childbirth and how to care for your newborn and yourself once you return home, we offer special educational courses. We cover nearly every aspect of pregnancy and labor through our “Teddy Bear University”. Courses include breathing techniques, breastfeeding, sibling classes, newborn care, labor and delivery, among others. For class schedules, call (865) 374-PARK, or visit the Teddy Bear University page. We are also proud to offer an online eLearning option for our Childbirth Classes! The Childbirth Center offers resort-style accommodations. Unlike traditional delivery rooms, our cozy private suites allow you to experience labor, delivery, and recovery in the same familiar location. Each birthing suite is beautifully decorated and furnished to offer optimal comfort throughout your stay. To preserve the aesthetics of your suite, necessary delivery equipment is carefully concealed. The spacious suite accommodates family participation in the experience. Each room has a bassinet so the baby can stay in the room with its mother and a place for a family member to also sleep overnight. A nursery is also available to provide expert care for your newborn as needed. Suites are designed so that babies can “room in” with mothers, allowing the critical bond to be established early on between mother and baby. Nursing staff are available to assist parents with caring for their babies in the room, addressing questions to help prepare them to care for their newborns once they go home. The Childbirth Center’s advanced communication systems and decentralized supply and workstations are designed to position nursing staff in close proximity to mothers so they can respond quickly to their needs. An entertainment center provides television, cable, and internet access. As an additional amenity, you have access to your very own whirlpool hot tub for relaxing tired muscles and finding a peaceful moment to reflect on this special time. Pregnancy care: To assist with severe low back or pelvic pain, carpal tunnel syndrome, thoracic outlet syndrome, tendonitis, and other musculoskeletal difficulties. Postpartum care: To assist with stress urinary incontinence, pelvic floor trauma, episiotomy scar pain, and help in establishment of exercise program. Urinary incontinence and pelvic pain: These problems can occur throughout a womens life cycle and can be treated conservatively through exercise, behavioral modification, muscular stretching and retraining, modalities, and many other therapeutic techniques. Physician referral is required and most insurance plans are accepted. Call (865) 531-5710 for more information. We strive to help you receive excellent prenatal care and planning. Our experienced obstetricians are committed to providing quality care for you and your family throughout your pregnancy and delivery. We can also provide specialty services, should you have a need. To ensure the best care for you and your baby, the Childbirth Center is staffed with highly-trained physicians and nurses, skilled in newborn care. Our experienced obstetricians and staff deliver more than 1,600 babies each year, and our RN staff is 100 percent certified in the Neonatal Resuscitation Program. In addition to our own labor and delivery personnel, we have Nurse Clinicians from East Tennessee Children’s Hospital on staff to assist your baby, if needed. If further emergency care is required, Neonatologists from Children’s Hospital are on call 24-hours-a-day, 7-days-a-week to work with your obstetrician. Surgical suites are also available if a cesarean delivery is scheduled or becomes necessary. Parkwest is a gold certified national safe sleep champion facility. 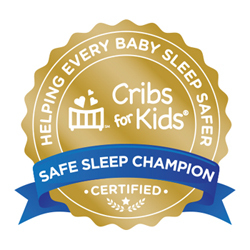 This is the highest certification level available in infant safe sleep practices. Breastfeeding your baby is recommended by the American Academy of Pediatrics. Supervised Skin to Skin is recommended to all mothers and infants immediately following birth regardless of feeding or delivery, and to continue for at least an hour. Because your newborn’s safety is a top priority, the Childbirth Center is designed as a secured area, with all entries and exists monitored. Video surveillance cameras are located throughout the facility to help security officers track any uncommon activity. We regularly upgrade our equipment to utilize the latest and most effective, yet unobtrusive, security methods. With the Hugs® infant protection system, each infant wears a tag that is monitored to prevent any infant being removed from the unit without proper authorization. Matching tag bracelets also identify all infants and their parents following delivery. Parkwest’s Safety Management Team takes extra precaution through a formalized Infant Security Policy detailing appropriate action for key individuals who would need to respond if there was an attempt to take an infant from the Childbirth Center. The policy includes education, training, and drills to heighten awareness of staff roles and responsibilities related to infant security. This provides parents with the extra assurance of maximum protection for their infants.